The Patterson Lumberjacks have always been a proud football program that has had plenty of success over the years. After a couple of down seasons, the program made a big hire in hiring legendary Head Coach Don Jones. Coach Jones has had plenty of success with wherever he has been. 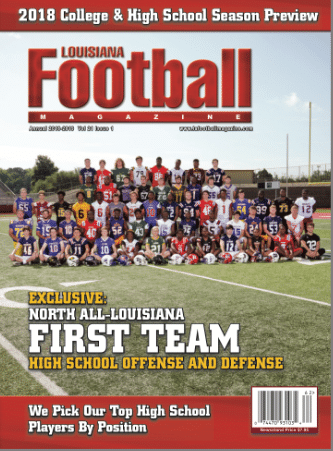 Whether it has been coaching stints at Plaquemine High School, Wisner High School, Sterlington High School, Crowley High School, Winnfield High School, or Woodlawn (B.R.) High School, all Coach Jones has done is win. In fact, he is one of the winningest active head coaches in the state with a career record of 234-164-3. Even for such a big time figure as Coach Jones, he knew that it was going to take a while for the players to buy into his system especially after the program made its fourth coaching change in four years. It sure has been a rough go round for this senior class with all of the coaching changes and also, add in the fact, that the Lumberjacks won only one game in 2018, it made it even more tough. Although, the results on the field was not what the team envisioned, there are still some very talented players that have a chance to play at the next level according to Louisiana Football Magazine’s recruiting guru Lee Brecheen. 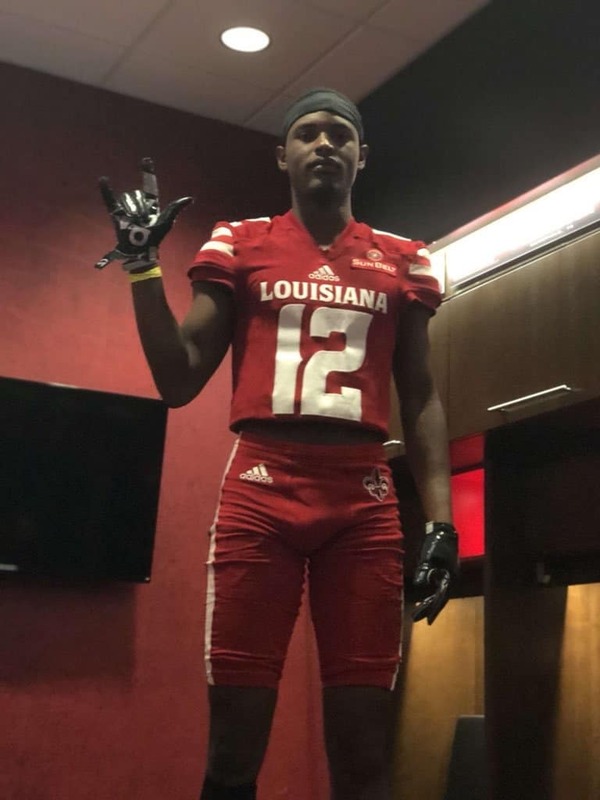 Both Butler and Celestine made plenty of plays at the skill positions, but both of them could not match the big time playmaking ability of one of the most underrated skill players in the 2019 class throughout Louisiana and that is senior ATH Dajon Richard. 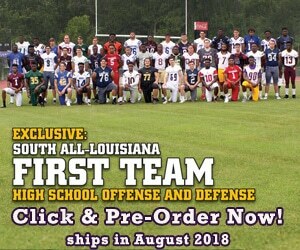 Richard has been really high on Brecheen’s list as he put Richard on the preseason 2nd Team All-South Louisiana team at the beginning of the season. After a big time junior year in which Richard did a little big of everything including throwing for 432 yards and five touchdowns, running for 1,143 yards and 10 touchdowns, having 19 catches for 563 yards and six touchdowns to combine for 2,153 all-purpose yards and 21 total touchdowns, Richard topped that performance keeping the Lumberjacks in every game with another 2,000 all-purpose yards and 20 plus touchdown performance. With back to back amazing seasons, Richard was able to attract a lot of colleges. “Some of my top colleges were UTSA, Kansas, South Alabama, Tulane, Southern Miss, and Middle Tennessee,” Richard said. After originally committing to the Road Runners of UTSA, Richard decided to decommit from Frank Wilson’s team. Later on, Richard would not only commit, but sign with South Alabama on Thursday, December 20th. 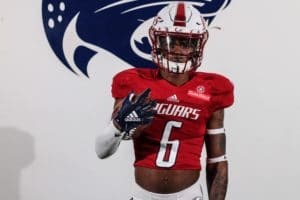 A big reason for the commitment was the program’s belief in Richard from the very start and that interest came a long way as far as the recruiting process in concerned. Richard can only imagine making an impact for the Jaguars as a freshman, but as of right now, he can focus on getting ready for that moment. “I try to stay in shape by training,” Richard said. 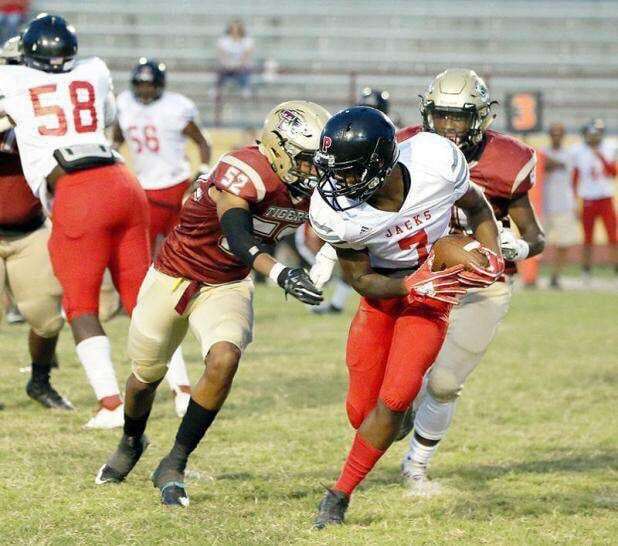 Richard is not only really talented and versatile, but he is a committed player that tries his best in the classroom posting a 3.5 GPA and on the field. So far, Richard has been the only player to sign, but Jaymioun Butler has received some opportunities to play. As of right now, he has received an offer from Louisiana College as well as a preferred walk-on opportunity with the ULL Ragin’ Cajuns. Besides Richard and Butler, the other seniors are still looking for opportunites to play at the next level. This is still a strong starting point for Coach Jones regardless of record. Knowing that there will be a couple of guys leaving to play college football at the next level comes to show you that the talent is still there at Patterson High School. Hey football fans. Like our recruiting interviews, stories, and other content on our website? 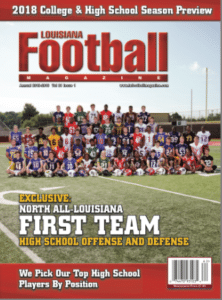 Click on our website daily to view articles on recruits, coaches, and so much more at our website: http://lafootballmagazine.com/. Also, we have exciting news that for the second straight year, we will have our North and South LA issues and both are now out! 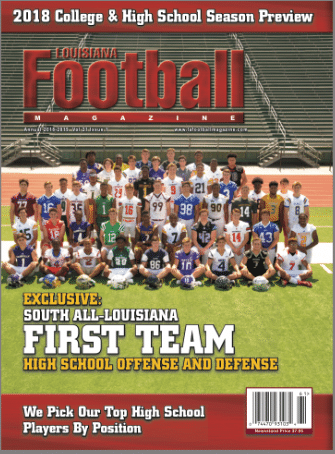 Both issues will continue to cover all the Louisiana colleges as well as all the high schools in state, but there will be 16 pages that will focus on North Louisiana as well as South Louisiana. For more information, please check the following link to where you can find the magazine in a store near you. Also, below are the two covers as well as where you can order both magazines on our website. Previous: LAFM TV Show! 13th Season! Episode 15 Now Available On YouTube!